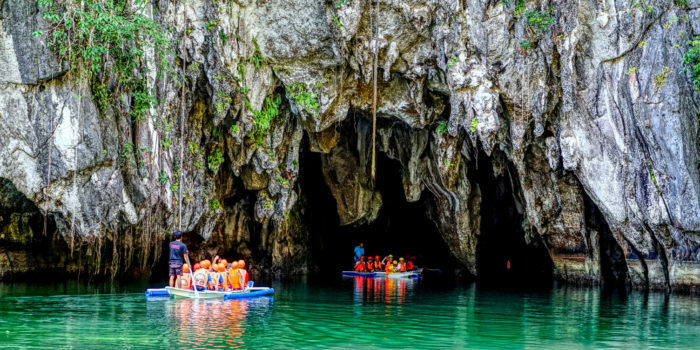 Puerto Princesa Underground River is located in Philippines and it is considered as protected area. This is located in national park and it is 80 Km in the north of city Puerto Princesa, Palawan. This is also famous with the name of PP Underground River. Saint Paul range is the area where this national park is located on islands western coast. The management of this national park is in administration of city government and they are managing this park from 1992. In the year 2010, some geologists and environmentalist has discovered this river that has 2nd floor that indicates that there exist a waterfall that in small in size in the cave. They have also revealed that the cave doomed about 980 feet above the river. The large bats, rock formation, deep water, deep cave and marine creatures are also there. There are other deeper areas in the underground river but because of lack of oxygen it is very hard to explore these parts. In the year 2011, this PP underground River is chosen for the very first time as the 7th new wonder of the nature. The confirmation of this wonder was officially confirmed in year 2012. The geography of this park is great as it got limestone Karst landscape and this PP river cave covers about 24 Km and got 8.2 Km of Cabayugan river that are underground. Before flowing to the sea the river went to cave and the cave have stalactites, large chambers and one of the largest cave rooms. If you want to see this beautiful river and natural beauty, it will take 2 hours ride to reach the destination from the city center. At the port of Sabang you need to take permit card and enter your information to get entry to the underground River. It is mandatory for the tourist to book in advance so that the tourism office at the port make schedule of your tour. After reaching the beach you need to pass through jungle trail and it will take you to near docking area of the PP River. Keep an eye of your surroundings as there are lizards and monkeys that can give you some trouble. Once you enter the boat the tourist guide will take you to the underground cave and give you information about the natural beauty and this 7th wonder of the nature. Of course you will see artistic and fabulous views in cave.